My friend Lisa left a comment on yesterday's post saying, "I'm crazy enough to join you but I'm also crazy enough to require lots of helps!" Well, here it is, to all my crazy friends, a simple schedule for you to print (I have no idea how to make pretty graphics with my computer, so I just took my markers, my journal, and my camera. If you come up with a prettier one and would like to share it with us, email it to me, and I will share it with everyone else). 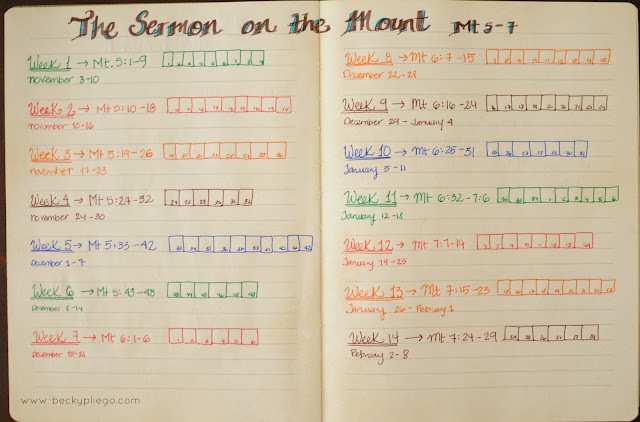 Beside the weekly verses I added some boxes to put a check on the verses that I have already memorized. These little boxes will also help me to make my schedule a bit more flexible and don't lose track of my progress. For example, this week I want to memorize all the beatitudes (Mt. 5:1-12), instead of only the first 9 verses of Mt 5, which means that I can check a few more boxes from the next weekly verses (I'd rather be ahead than behind before Christmas comes). How will we keep each other accountable? What if we meet here every Friday to share how we are doing? If you have a blog and decide to post about your progress every week feel free to link to it. I will also be posting every Lord's Day a prayer based on the weekly verses (instead of my regular Praying the Psalms series), because I have found that one of the most wonderful benefits of memorizing the Scriptures is that you can use them more effectively, as a sword in the hand of a warrior in your prayer time. So here we go, Sisters... May God bless our minds and hearts.